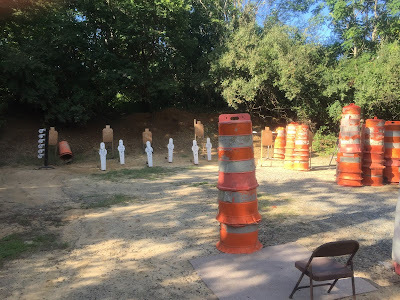 It's been a month since I was able to enjoy a mid-week diversion of IDPA at Black Creek, so I was excited that my schedule allowed me to shoot this week's match. I didn't get away from work as quickly as I had hoped, but still arrived at the range in time to join the last squad of the day. The first stage started out with the shooter facing up range, in front of a wall of barrels. At the signal we turned and engaged two targets on each side of the barrier. Each target required two hits to the body and one to the head. A missed head shot contributed to a total of 9 points down. On the second stage we started seated in chair, with a barrel stack as cover to shoot around. There were four targets requiring 3 hits each, and all shooting was done from a kneeling position. Dropping to a knee behind the barrel I engaged the two right targets, then shifted to the left to finish off. Some folks managed to shoot all the targets from the same side. Again, some sloppy shooting added to my time. For the last string of fire we started standing, facing the targets. Six paper targets set in a wide array were first engaged in tactical sequence, followed by six falling steel targets. After the performance on first two stages I made extra effort to concentrate on the front sight to try to finish strong. As I made my reload, my gun jammed with a double feed and failed to go into battery. I ended up having to pull the magazine out and inserting another. I lost a good 6 or 7 seconds easily. After finishing the final paper target, I quickly ran the steel. If not for the malfunction, it would have been an excellent run. Despite the poor shooting, it was still fun. Some days it just doesn't come together. At least the good hits and fast steel on the last stage had me leaving the range on a high note. In the end, it was time on the range, and that beats not being on the range any day.